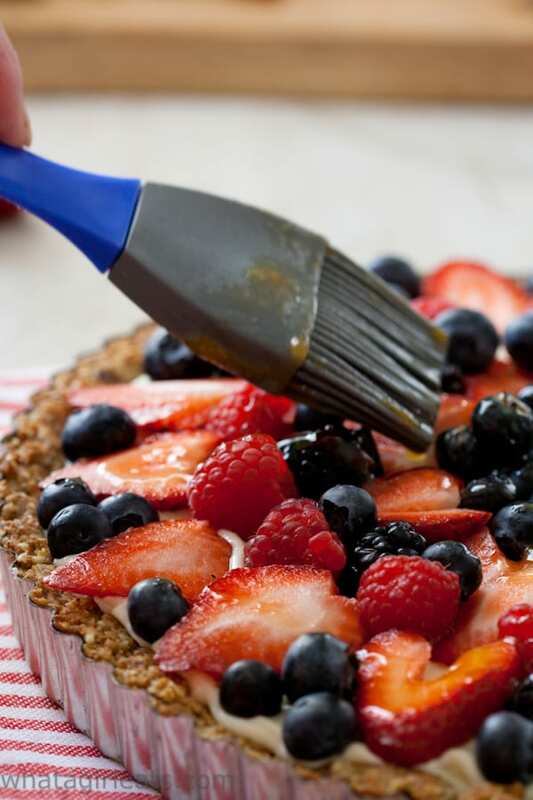 I’ve updated my Red, White, and Blueberry Fruit tart with a new grain free crust! 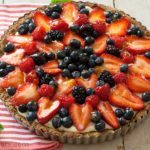 The original recipe, Patriotic Red, White and Blueberry Fruit Tart, posted on September 10th, 2011, was due for a update. While I love the original graham cracker crust, I’m always looking for ways to eat all our favorite treats with less sugar, and gluten or grain free, if I can do it without sacrificing the flavor. Use any crust you’d like! The most difficult part of the recipe is letting the pie chill for a couple of hours before you decorate it, so do prepare it in the morning if you plan on serving it later in the day. 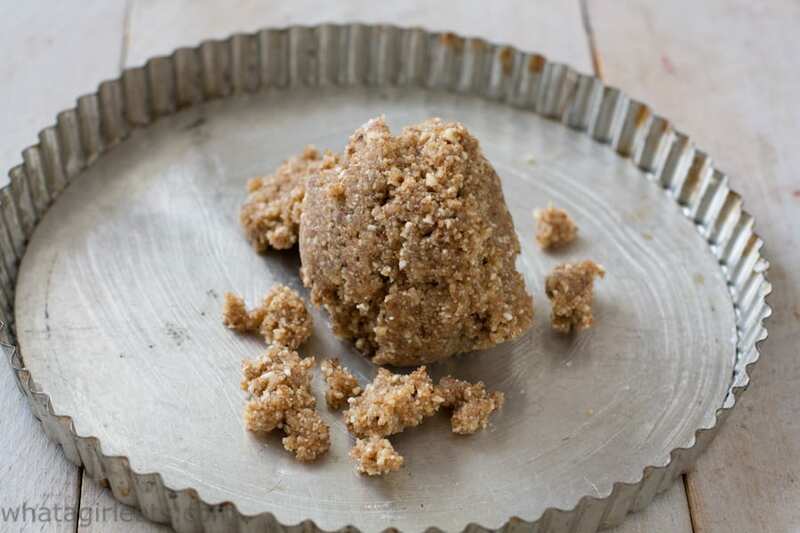 For the grain free nut crust; mix the nuts, butter and a few dates for natural sweetness. Pulse nuts, butter and dates in a food processor. 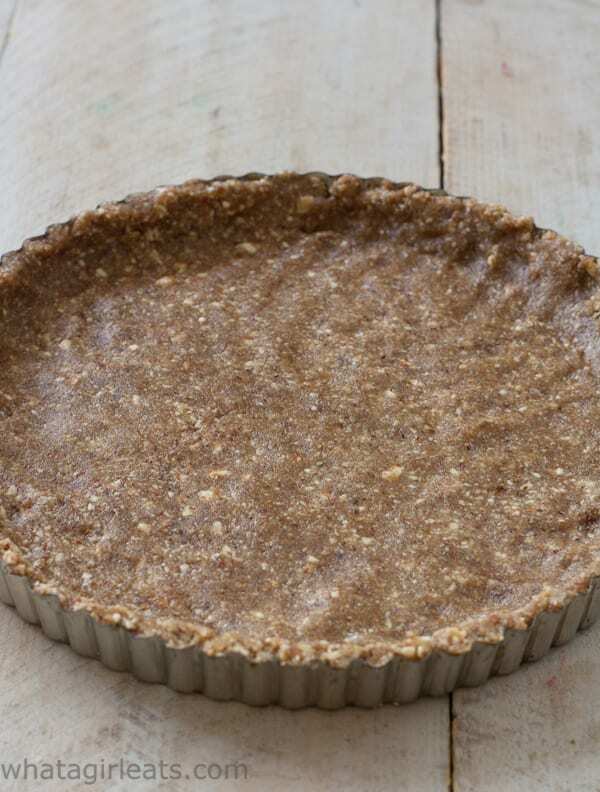 Press nut mixture into a greased pie plate or tart pan with a removable bottom. Press the crust up the sides of a tart pan with a removable botto. Bake the nut crust for about 10-15 minutes to set it. Allow it to cool to room temperature. Allow baked crust to cool. While the crust is cooling, prepare the filling, (which takes about 3 minutes!) and prep the fruit. Spread the filling into cooled pie crust. Spread filling into cooled crust. Arrange the fruit in any pattern you wish. Arrange fruit in a pattern starting with center and moving outward. To achieve a bakery quality finish, brush the top of the fruit with an apricot glaze before chilling. 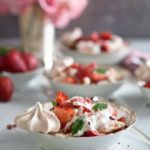 If you’re looking for more patriotic desserts, try Star-spangled meringues with fresh berries, or this simple fresh strawberry pie. 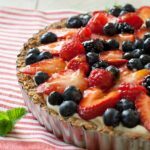 If you’re looking for more grain free desserts, try this Grain Free Berry Tart or Strawberry Fool. 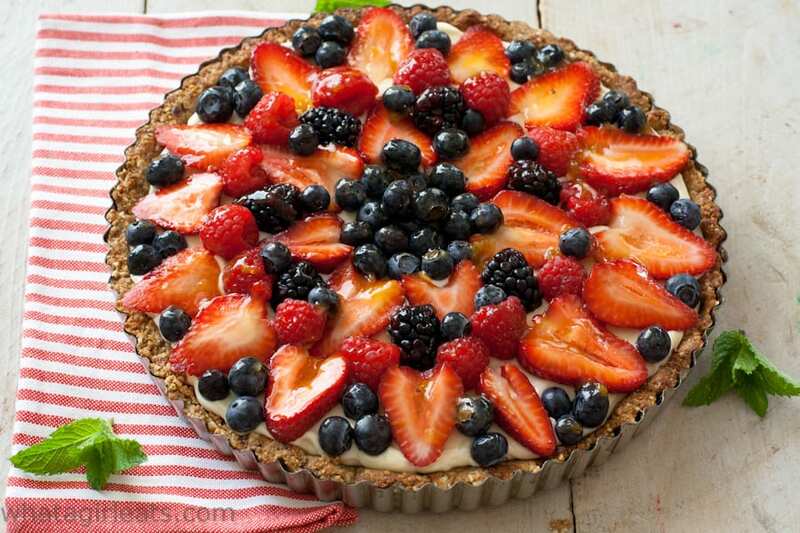 I hope this Grain Free Fruit tart becomes one of your favorite patriotic dessert recipes. This no-bake fruit tart is adapted from Nigella Lawson. 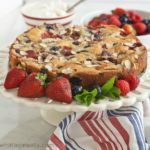 It is one of my favorite patriotic dessert recipes! 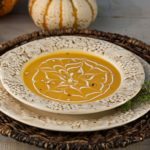 (I've included the original crust recipe for those who do not need a grain free/gluten free option. Soak dates in hot or warm water 5 minutes, then pit. In a food processor, fitted with blade, pulse nuts, butter, dates and salt until a dough forms. Preheat oven to 350 degrees F. Press dough into a greased tart pan with removable bottom. Bake for 12-15 minutes, or until crust is golden. 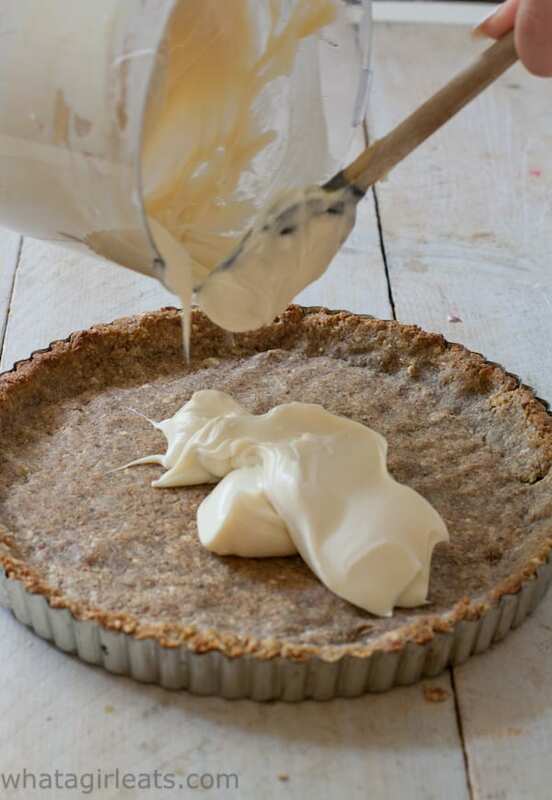 In a clean processor bowl, process the cream cheese and lemon curd and spread it into the bottom of the chilled tart crust, covering the base evenly. Arrange the fruit gently (so it doesn't sink in too much) on top of the lemony cream cheese. For the glaze: mix 2 Tablespoons apricot jam and 2 Tablespoons water in a small sauce pan and cook over low heat, stirring until jam is melted and thin enough to brush over fruit. Add more water if necessary. 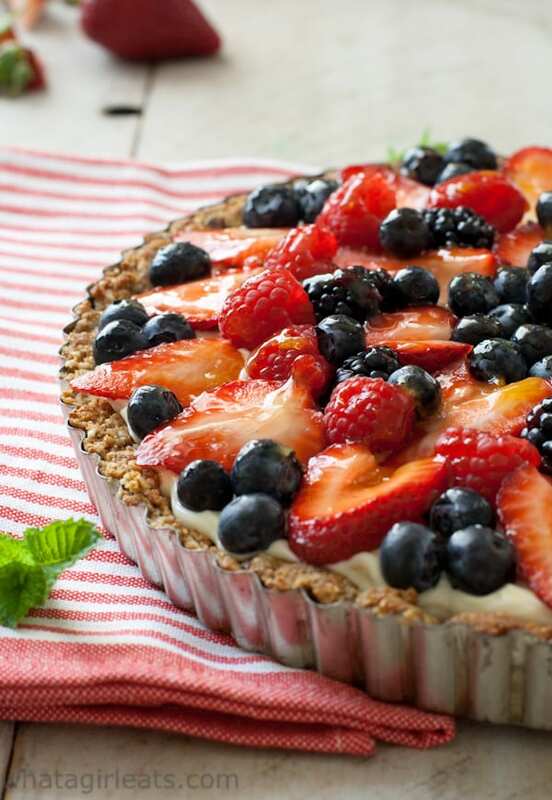 No-bake Red, White and Blueberry tart with lemon cream cheese filling. I love that you don’t have to bake the crust. I have homemade lemon curd sitting in my refrigerator and I was wondering what to do with it, now I know. I can’t wait to make this. Hi Cathy! Thanks for stopping by! Great to see you at camp this weekend. How beautiful and delicious! You can’t go wrong with fruit and cream cheese. Such a lovely tart. Anything with graham crackers and lemon curd has to be divine. Melissa, I agree! I like that you can make the fruit in any pattern you choose too! Kim, thanks for stopping by! I definitely will! Thank you! Just pinned and will be sharing on FB as one of our great features this week at Freedom Fridays!!! Thank you for stopping by Evelyn! A perfect no-bake dessert and it’s pretty to boot! Absolutely beautiful! Summer fruit tarts are so pretty, and satisfy my sweet tooth perfectly! Really beautiful and perfect for the 4th! I’m not much of a baker, but it looks easy enough even for me! I love a pretty tart, and this one is GORG! This tart is gorgeous, Cynthia! 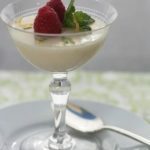 Desserts like this are my favorite in the summer! 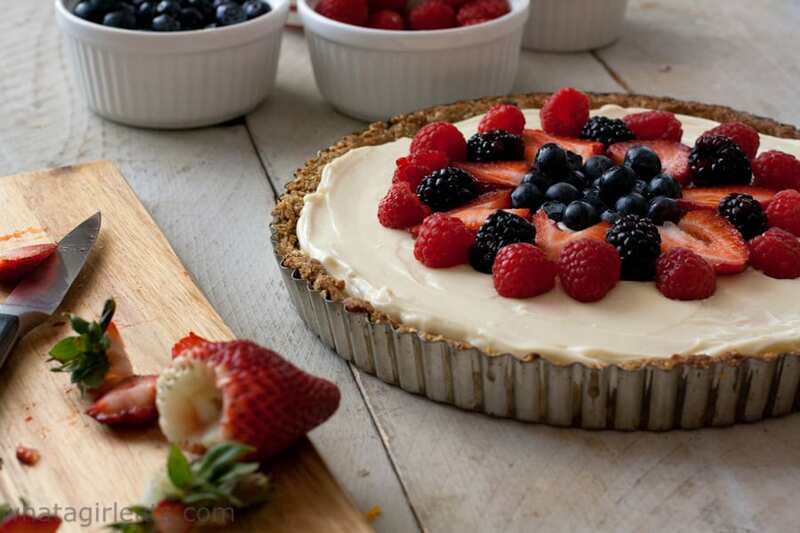 Oh wow, this tart is beautiful! Perfect for a cookout this weekend! This tart is so pretty! So perfect for Memorial day! This is just the prettiest tart I’ve seen! It’s beautiful! I love all the berries we get in Summer, they are so pretty to photograph and you can make amazing patterns with them on desserts! I love nothing more than a fresh fruit tart on a warm Summer’s night! I’d love this with a cookie crust! How fun!! So delicious and colourful looking with all the fresh fruit! Love the nut and date crust too. Pinning this one. Yes, it’s nice to have options for everyone. Thank you Natalie! That looks amazing, loving the filling but I have to say that crust sounds jaw-droppingly good! Thank you Brian. The crust is so good, you won’t miss the graham cracker crust. 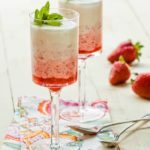 I’m all about berry desserts in the summer and this one looks just perfect! Saving this for my next upcoming barbecue! Me too…so much lighter than chocolate. This looks fantastic! 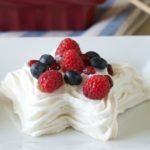 Perfect dessert for any 4th of July party! Yes, isn’t it? You can change the fruit around too. The perfect summer dessert, for sure! Such delicious flavours. Thank you Bintu! Yes, great for summer. Wowzer this looks delicious!! What a combo of goodies! Thank you Tessa! Great for summer! What a gorgeous tart! And so easy! Very easy Linda and versatile! Such a gorgeous tart! This will be perfect for all the summer holidays. Thank you Jean.Yes, a great summertime dessert! What a beautiful dessert! Love the nut crust too. 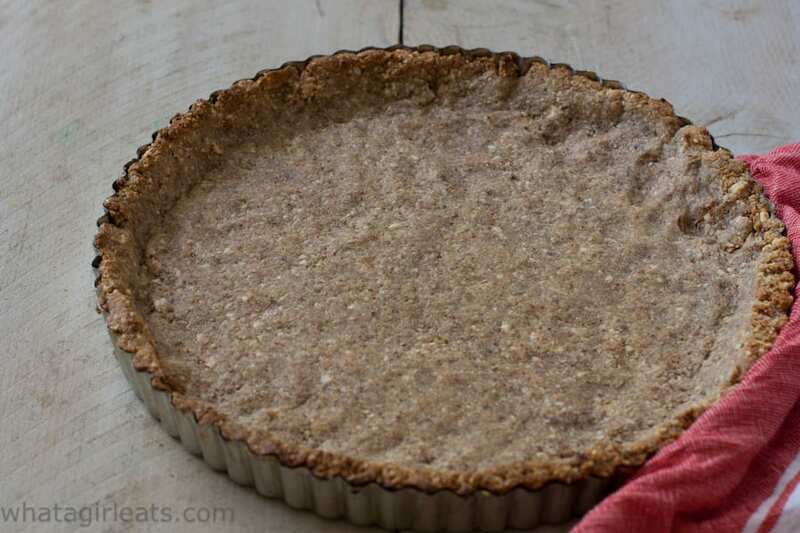 The nut crust is so good, you don’t miss the graham cracker crust at all! That photo with the filling going into the pie!! This looks so delicious and beautiful! Thank you Megan! I love the name of your site! That says it all! So beautiful and perfect for picnics all summer long! 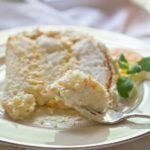 That cream cheese lemon filling, wow… can’t wait to try it out! So simple too. And you can change up the fruit. What a beautiful dessert. Love the colors. Thank you Yvonne! Perfect for the 4th! How delicious, Cynthia – love the sound and look of this wonderful crunchy base! Thank you Jill! The perfect base! I love nut-based crusts, although I don’t remember making any without flour. But why not, if it works?!! This is a beautiful dessert. It totally works Mimi, and I love that it’s so much healthier. Lemon curd is heavenly! 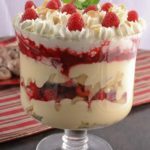 This looks like such a fantastic dessert for the summertime. 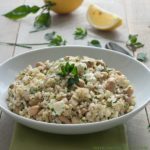 I love that you rewrote the recipe for grain-free, much appreciated! Thank you! 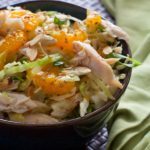 I’m slowing trying to update my recipes to use less sugar and gluten. This is so fun and festive for summertime and perfect for the 4th of July! Love this idea with all of these delicious berries! I love berry desserts! 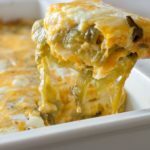 I will definitely make this soon! What a gorgeous fruit tart. This is my favorite. So perfect for summer. Thanks for sharing !